This is the 50th Bay Area Brit blog, and the first one of the year. I have catalogued my Ten New Year’s Resolutions and will reveal how I’m doing. 1. To Be A Better Person. Well that’s working out pretty well, because the better person I wanted to be was Mother Teresa. As it turns out Mother Teresa is dead, and therefore by just existing I am a better “person” than she is. However, regarding otherworldly incarnations she’s got me in a heavenly headlock. So I take the train a lot, and every single night at the BART station I see this guy pretending to be flustered because he just lost his wallet, and he only needs another $2.80 to get back to the City. Again and again he pitches me the same story, like he doesn’t remember me. I’m going to help him by not giving him an angry glare when I see him shuffling towards me, and I’m not going to say: “Every time I see you, you’ve lost your wallet.” Instead, I’m going to tell him that they now have these little chains that you can attach to your wallet and loop onto your pants. 3. To Be More Tolerant. Who am I the Pope? No, wait, I am more tolerant than the Pope. Every summer they tell me there’s a drought on — an actual water shortage, people. And so I am fighting the fight and being responsible by drinking more beer and less water, hardly any water in fact. SAVE OUR PLANET! 5. To Eat More Healthily. Well that’s kind of relative. You see I do eat more healthily than a whopping 34 percent of the country. If you were a baseball player and you hit better than 34 percent, you would be in the Hall of Fame. 6. To Set Realistic Goals. Writing down and fulfilling any form of New Year’s resolution was an unrealistic goal. FAIL! 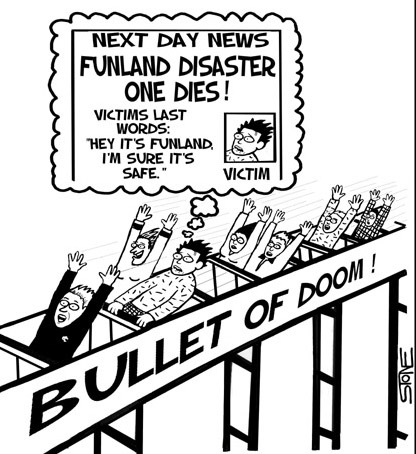 FUNLAND ROLLERCOASTER DISASTER: ONE DIES. Because if the parachute does actually FAIL, my stupid Facebook post about the ACME INC. parachute will be there forever. The Bay Area Brit’s final status update. At first it would be sad and tragic, and then the more you saw it, the funnier it would seem. Ta-da, easily achievable, since I didn’t ever start smoking. But since I didn’t start by definition I cannot quit. FAIL! This kind of falls into the “be a nicer person” category, but there are people out there that are just (through no fault of their own) dull and uninteresting. I resolved to listen and nod politely, smile, and even laugh when prompted to do so by their own laughter indicating that they’re finished with their tedium. You may now laugh or nod politely. Whew! I was missing my fix of Bay Area Brit! I am getting back into the bar biz, so #9 is especially important to me. You remember, right Brit?? I had to act like I understood your accent. Just like that Brummie bugger I know! Thanks, Patty, and happy new year to you and that Brummie bugger. Very, very funny Mr. Stone.